Benches make your space more inviting and comfortable. Whether the bench in the garden that visitors can sit on to catch their breath, or the bench in your waiting room, benches are an important part of your architectural space. Glass Fiber Reinforced Concrete (GFRC) benches are not only pleasant to sit on, they are pleasant to look at and durable, too. The durability of a GFRC bench is very important. People do strange things sometimes, and benches need to be heavy enough to be hard to move and durable enough to withstand lots of use. Stromberg GFRC benches fill this need. Appearance is also important. GFRC benches can be cast in a number of very pleasing styles. You can see pictures of some of them in our gallery. We also do custom benches from your design. 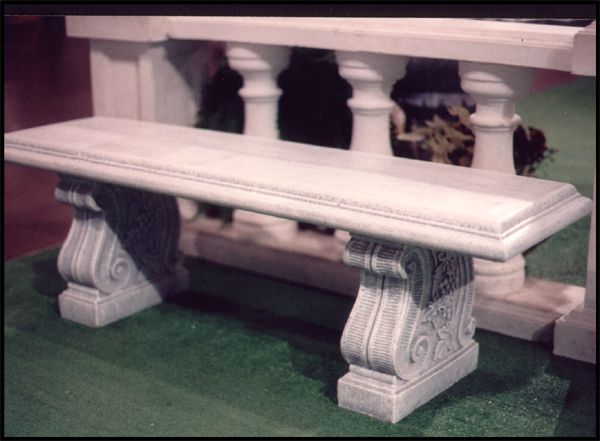 Benches can be smooth or rough textured and can be cast to mimic limestone, terra cotta, marble, bronze, and even gold. The GFRC can be colored to match any decor, as well. Imagine having a durable, good looking bench in your lobby that perfectly matches the colors there. Because GFRC benches are cast, we can create unusual shapes to decorate them. Imagine sitting on a bench shaped like a swan, or with mermaids on the legs holding the bench up. If you can dream of it, we can probably make it happen. Ready to get started? For more information and assistance with your design challenge, please call us at (903) 454-0904 today or email us at info@strombergarchitectural.com. We look forward to hearing from you!